" Ruriee… our promise… promise…"
" What would flying in the sky even mean for you and me? " Ruriee interrupted him forcefully. " If we fly in the sky, would we have anything good? Would we be able to get delicious food? Would we be given beautiful pebbles? If we did, would you become a king? " " N…No! No! Ruriee! What we could get is nothing like that… We could find excellent happiness in that the dream we had together would come true. That alone… that alone would be fine, don't you think? " " So… so… you remain a white fish.” The voice coming from Ruriee strongly affirmed that she was bidding Zyun farewell. With these last words, she completely extinguished any power Zyun had left.
" Hey, White! 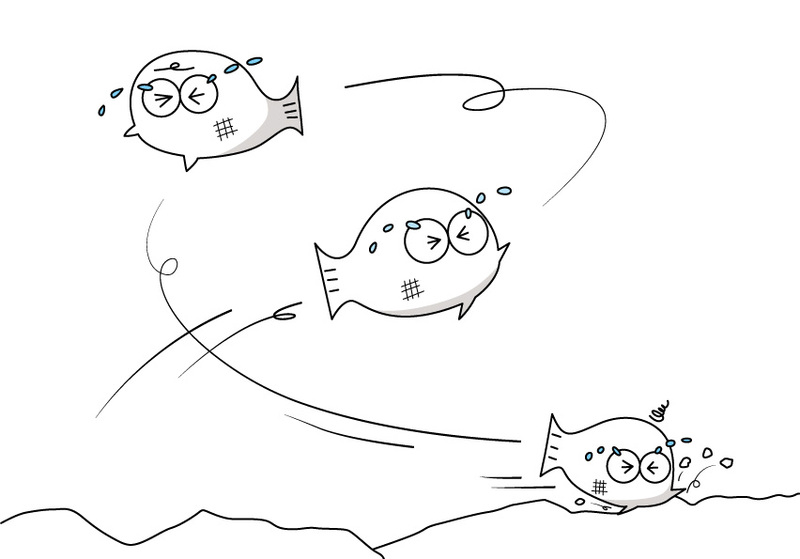 It is nonsense for fish to try to fly in the sky. Don't think such a stupid thing. You should live in reality more, and you should become a strong fish like me." Aretel and Ruriee left. After their figures disappeared from Zyun's view, Zyun began to cry. His tears dropped one after another. Because he was not satisfied by any action he could take, he began to cry even louder. He swam crying in the water as if he were a balloon that had lost its direction and had air coming out of it.
" Why? Ruriee! Why! " He felt pain and sorrow as if all his body and his heart had been cut.